Best Practices recently completed the second roundtable of our 2014-2015 Medical Affairs Consortium. The roundtable addressed the topic of “Medical Affairs Launch Support.” The roundtable brought together executives from 13 leading pharmaceutical organizations. Thought Leader Engagement & Advisory Boards: Medical Affairs plays a leading role in thought leader selection, segmentation and relationship management, as well as in creating and executing advisory boards. Eighty six percent of the total benchmark class leads Thought Leader Management Activities and Advisory Boards. Opportunity Area: Medical Affairs has the opportunity to invest more time and efforts in the Clinical Research and Operations area. Areas that were identified as important involvement opportunities included: Investigator and Site Identification, Clinical Trial Research, and Protocol design. For the majority of the benchmark class, Medical Affairs is in a support role for these activities. 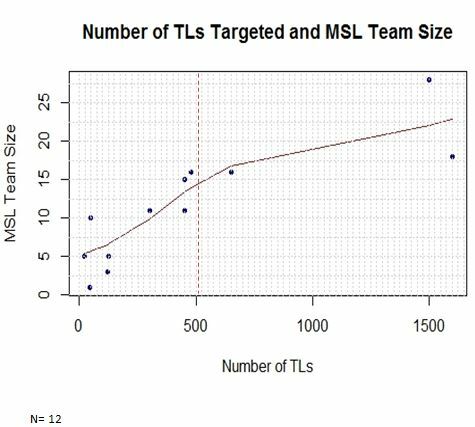 We observed a stronger increase in MSL team size up to 500 targeted thought leaders. However, this increase starts flattening as the targeted number of thought leaders increases.